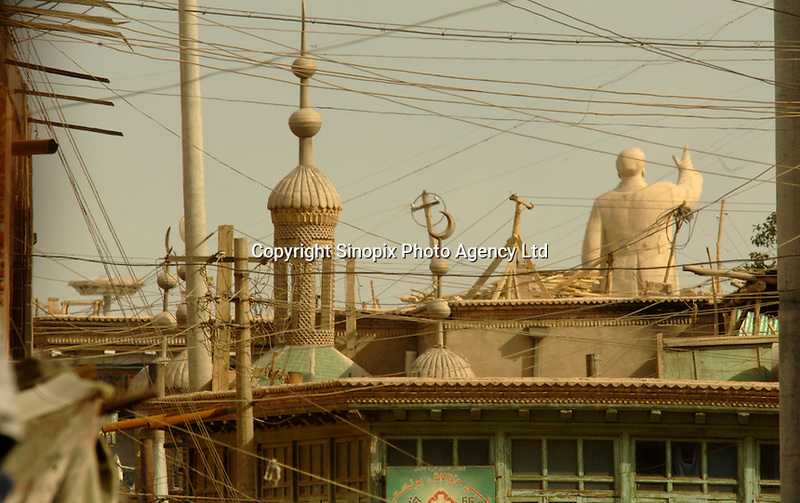 The crested moon from a mosque is juxtaposed against a statue of Chairman Mao in the old town of Kashgar, Xinjiang Province, China. Kashgar is within a few hundred kilometers of the Afghanistan, Pakisthan and Indian borders and it's people mostly belong to the 20 million ethnic Uihgurs, who do not consider themselves Chinese but part of lost state of Turkestan. The Uihgurs have been fighting an underground gorilla war and certain groups are seen as terrorists by the Communist Party..